Birthplace : Jersey City, New Jersey, U.S.
Jerry Herman wrote the music and the lyrics for three of the longest running musicals in Broadway history, Hello Dolly!, Mame, and La Cage aux Folles. Jerry Herman was born on July 10, 1931 in Jersey City, New Jersey, the only child of Harry Herman, a gym teacher, and Ruth Sachs Herman, a former pianist and singer. His parents also ran a camp in upstate New York, where Herman spent his summers as a child. Herman wrote in his memoirs, "I learned about prejudice at an early age, when a group of neighborhood boys threw stones at me on my way to Hebrew school." His parents were active in the local Jewish community center, and they made their shy son attend events there. Harry and Ruth Herman loved music. Harry played the saxophone and Ruth played the piano and accordion. After dinner each night the family would play show tunes. The Hermans attended Broadway shows once a week, and Herman recalled that he was inspired by the performance of Ethel Merman, at the age of 14. Herman had a close relationship with his mother and she always encouraged his love of music. Herman's relationship with his father was more difficult. The gym instructor wanted his son to be athletic. Herman had no interest in sports, which greatly disappointed his father. In high school, Herman had few friends. He came straight home from school to play the piano and rarely socialized voluntarily. At the age of 18, Herman staged a musical at his parents' summer camp, which was a great success. Herman's father was finally proud of him. Herman studied architecture and design at the Parsons School of Design for one year. After receiving encouragement from a famous songwriter, Herman decided to give song writing a chance. He transferred to the University of Miami, which had a very modern theater department. There he learned how to act, direct, and design a show. On his first day of college, Herman met Carol Dorian. The two remained close friends until her death. Herman joined a fraternity and became much more social. Many years later, the University of Miami named a theater after him. In 1954, Herman put on a show of the material he wrote in college. I Feel Wonderful was an off-Broadway musical revue which played at the Theatre De Lys and was financed by Herman's father. Herman was pleased that his mother was able to attend the show, because she was ill with cancer and died that same year, at the age of 44. In a 1986 interview with People Weekly Herman said of his mother, "She was glamorous like Mame and witty like Dolly. When she walked into a room, she lit it up." Carol Channing, a friend since 1963, thinks Ruth is the key to understanding Herman and his work. "He grew up adoring this big, pizzazzy woman. Jerry always writes for wonderful, big avalanches of women. Jerry never replaced his mother in his life. He's been writing for her ever since." About a year after Ruth Herman died, his father re-married and moved to Miami. Herman, who had been still living with his father, found his own apartment in New York City. He became very close to his mother's sister, Belle. In 1958, Herman put together a cabaret show called Nightcap, at a jazz club in Greenwich Village. The show received rave reviews and soon after, Herman had an agent, Priscilla Morgan. Nightcap ran for two years. In 1960, Herman turned his cabaret show into a theatrical venture called Parade by adding scenery, costumes, and a big-name star. After the show had run for a few weeks, a real estate tycoon named Gerard Oestreicher asked Herman to create a Broadway show about Israel. Herman flew to Israel with the sciptwriter, Don Appell. Representatives of the Israeli government gave the two Americans a tour of their country. While Herman was very impressed with what he saw, he felt that he was being subjected to government propaganda. He and Appell decided to rent a car and see what they could for themselves. Herman noted the unrest, the fear, and the poverty of the country, as well as its good points. Appell suggested they write a show about a group of American widows who take a trip to Israel. The show that was developed from this idea was Milk and Honey, starring Molly Picon. This was Herman's first Broadway production. The New York opening took place on October 10, 1961. The show got rave reviews and Herman was nominated for a Tony Award for the score. The 27-year-old Herman became one of the youngest composers on Broadway. Producer David Merrick, who according to Herman's memoirs was "a very tough man who loved to intimidate people," saw Milk and Honey and asked to meet with Herman. Merrick was looking for a composer-lyricist to write the songs for Hello Dolly! Herman asked if he could read the script and if he could have the weekend to come up with some songs. The five foot, eight inch, 135-pound composer-lyricist described that weekend in his memoirs. "Those three days were the turning point of my career. I produced those four songs in two days of the wildest, most intensive writing binge of my life. I was like a crazed person, pacing up and down in the middle of the night, scribbling down lyrics and popping candy in my mouth. But I was young, I was full of energy, and I wanted this happy, brightly colored American musical more than anything in the world. I was determined to get this job. There was a new aggressiveness in me, this desperate need to prove something to myself. I killed myself for this job." On Monday morning, after hearing the songs, Merrick said, "Kid, the show is yours." The production was an enormous hit and Herman developed a close friendship with its star, Carol Channing. Working on the show, however, was emotionally traumatic because of the difficult personality of Merrick. Herman won numerous awards, including a Tony for Best Composer and Lyricist of 1964. The show ran on Broadway for seven years and was made into a movie starring Barbra Streisand in 1969. Herman's next triumph was Mame, a musical about an orphan who goes to live with his Aunt Mame. Herman helped Angela Lansbury get the role of Mame, and the two became close friends. Herman loved working on the show, which won Variety's Best Lyrics award. Mame ran on Broadway for five years, from 1966 to 1971. Herman wrote songs for Dear World, a musical version of the play The Madwoman of Chaillot. Angela Lansbury played the Madwoman and won a Tony Award for her performance. Although the show ran for six months, it was not a big success. Herman's next show, Mack and Mabel, was about Hollywood producer Mack Sennett and silent film star Mabel Normand. The show ran for six months in 1974. About 10 years later, when an ice-skating team performed to the overture from Mack and Mabel during the 1984 Olympics, the music from the show became quite popular. In 1995, the show was revived in England. Of all his shows, Herman's favorite score was the one written for Mack and Mabel. After the initial failure of Mack and Mabel, Herman became depressed and did not want to write musicals anymore. The financial success of Dolly allowed Herman to buy an old firehouse and renovate it. The magazine House Beautiful ran an article on it, and Herman's second career was born. During the 1970s, he turned to decorating houses and reselling them. Herman could have lived well just off the profits of his hits, but he found decorating to be therapeutic. Herman wrote the songs for the musical The Grand Tour, which came out in 1979. He wrote of the show in his memoirs, "It got nice notices because it was a nice show. It just didn't have the energy and the excitement to become a real hit. And now here I was, with my third failure in a row." Herman wrote the score to La Cage aux Folles, a musical about two middle-aged gay lovers. One of the songs in the show, "I Am What I Am," has become the gay national anthem. The show won six prizes at the 1984 Tony Awards and had a Broadway run of five years. Gay critics claim La Cage aux Folles is too safe, but Herman believes, "One day when they are old and gray they will realize what this show is doing for their cause and send a thank-you note." Jerry's Girls, a revue featuring 37 tunes from nearly all Herman's musicals, was quite popular. He argued in a Time magazine article that in the theater, "The strongest single force you could have is a larger-than-life lady on the stage," explaining his love for the big female lead. The show was a statement about what Herman stands for, "the simple, hummable show tune," he noted in a 1986 People Weekly interview. Herman lives his life simply, too. A good time for Herman is "going out to the movies and then out for a hamburger with friends." 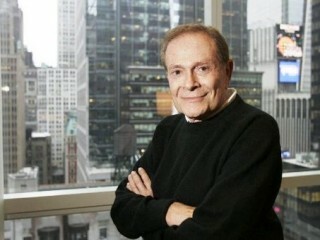 View the full website biography of Jerry Herman.